May 23rd, 2016, on Hulu Plus. I was wholly unfamiliar with Chaplin’s work. I suppose that’s acceptable from a non-movie buff or rookie critic. I was looking forward to this introduction. It’s clear where most of the Looney Tunes got their inspiration. Several moments in the film were laugh-out-loud funny, characterized by physical humor and facial expressions. On the other hand, I felt the film at times fell short in the drama department, playing up a romance that was never really there, despite a touching lonely scene with the Tramp and a vacant dinner setup. To its credit, we’re immediately thrust into a desperate period of history, and we certainly feel the frigid environment and its effect on the Alaskan rush’s prospectors despite the many slapstick moments. Some of the action was very tense and maximized the use of effects in that time period. The ending was weak and borderline superficial — I wanted a lot more meaning with all of the buildup to that moment. I found the costuming somewhat laughable — it was clear the girls were in full flapper regalia, a look that did not exist in the late 19th century. The score was perfect and at times breathtaking. (upon some research, I saw this replicated in Benny and Joon. Why is this ranked #132? Being the first Chaplin entry on the list, I would guess this is among the “weaker” of the preserved films by him. I assume I’ll see better ones. 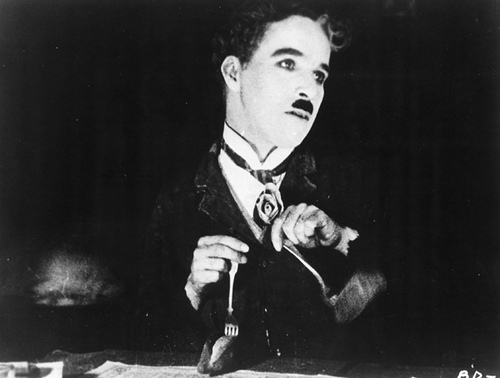 However, voters probably recognize Chaplin’s legend and have voted this one far higher than I believe it should be. She missed most of it, but likewise laughed at some of the humor presented. Probably not. It’s not a poor film, but it’s nothing terribly exciting. History says one should see a Chaplin film, and according to Chaplin himself, he wanted to be remembered for this one. I don’t know how the others are, but I would have to disagree. Yes, I think you should watch it for what it’s worth, but I presume there are better works out there. I’m not sure yet. It’s not as good as several of the films below it, but it’s certainly not the worst. There are memorable scenes and some innovative, unprecedented traits about the movie, but nothing was particularly gripping about the story itself.